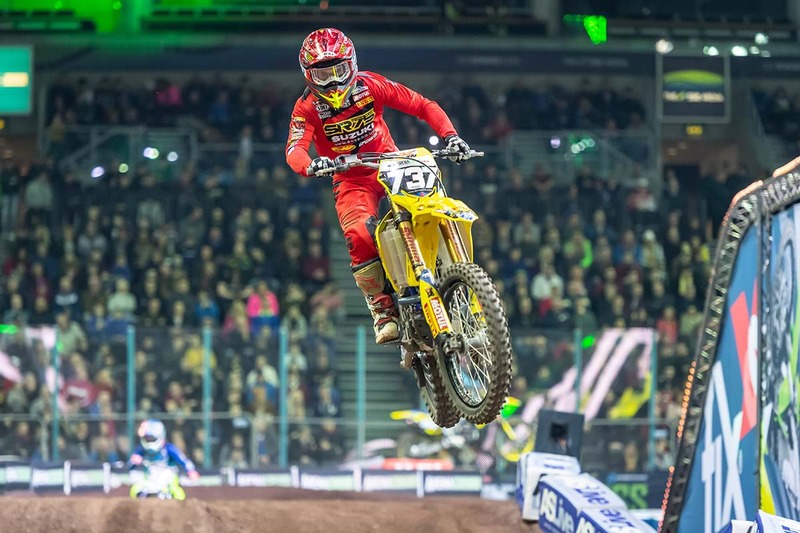 SR75 World Team Suzuki left Belfast battered and bruised this weekend, but head back to the mainland after two nights of Arenacross racing with seven podium finishes and second in the Pro 450 championship. The team endured an up-and-down opening two nights of this year's Arenacross championship, but RM-Z450-mounted Charles LeFrancois currently holds second in the championship standings, after finishing on the podium in both 450 main events on Friday and Saturday night. Unfortunately for the talented Frenchman, he suffered from some bad luck in the combined Super Finals, including being on the receiving end of some forceful moves that saw him end up in the dirt. However, his main event results mean he is still at the sharp end of the points table. His RM-Z250-mounted teammate, Valentin Teillet, struggled on the opening night with small mistakes and crashes costing him. However, he found his feet on the second night and finished second in both 250 main events, before finishing third in the combined Super Final. The points haul means he climbed to fourth in the 250 title chase. Arenacross continues on February 1 at Birmingham's Resorts World Arena. For more information, click here.